Rachel Gillett is working as System administrator at Universal Containers. She has developed a flow to get the Sales reps feedback. 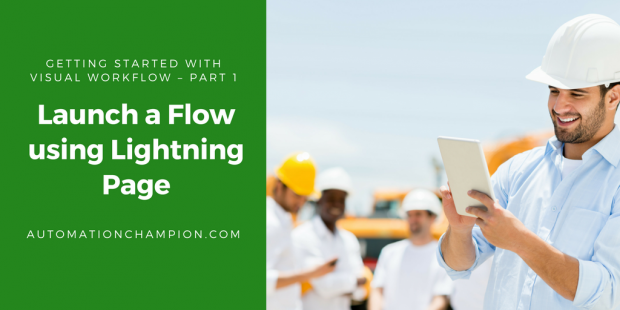 She wants to use the Lightning App to launch a Flow. Once you’re done, click on the Save button. It will save the current definition of your app. 5. The final step is to activate the Lightning page. Activate adds your app the Saleforce1 Mobile navigation. It also allows you to set the Tab visibility. Thanks for all the great sharings! I got one question: what’s the difference between adding directly the “survey” flow to the lightning page and adding VF to the page? I tried both at my developer org but both work. I’ve always wondered flows and VF pages. This tutorial answered allot of questions and showed me a thing or two. I love how you can easily add this flow as a tab in SF1. What are your thoughts around adding style to these VF pages used for flows? Every time you come up with something innovative. This is a very useful and informative post. So once again something new to learn from this part 1 to the end of it. One question Rakesh: The process builder part 2,10,26. I don’t have these part,don’t know how i have not got these in my mail. Rest all part till 38 i have. Can you please send me these 3 parts please ? And part 38 is the last part or more to come ?